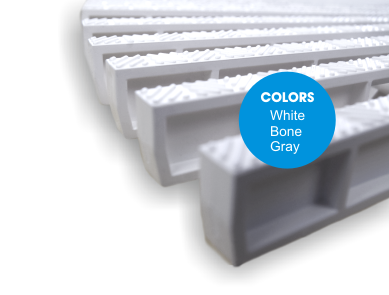 Perpendicular grating is by far the most popular for deck-drain gutter systems. But did you know that the IBC standard for Child Finger and Toe Entanglement requires a gap opening of no more than 8mm? Daldorado grating meets these IBC guidelines and more to help avoid small fingers and toes from getting hurt. Available in standard 12”, 14” and 16” widths, our perpendicular grating conforms to both radius and straight configurations. Hand holds and curb angles available for true ledge support (radius or straight). Easy and worry-free installation. All corners are custom manufactured and strengthened for inside-outside corners per design requirements. Fully warranted by Daldorado. featuring a gap opening of only 8mm. Made of high-grade UV-stable PVC (Axiall 7140) ~ Certified for NSF50. Certified to IBC Classification C For Wet-Barefoot Inclining Platform (Ramp) test for Swimming pool ramps and stairs leading to water, swimming pool surrounds and communal shower rooms, communal Changing Rooms. Complies with the new IBC standard for strength, specifically access covers and grates (3996 Class A ~ over 10kN). Available in three colors ~ white, bone & gray. Other colors available with a quantity guarantee. Fully warranted for 10 years against manufacturer defects with a focus on offering the best customer service in the industry.